Piglets are in the sow's uterus at a stable temperature of 39-40ºC. At birth, piglets are highly sensitive to drafts and low temperatures. Piglets are born wet and with little skin insulation, because they have so little hair and fat. They have very few energy reserves at the beginning of their life, and must expend a large amount of energy to get to a teat and obtain colostrum, their first source of calories. All these factors mean that, during the first half hour of life, all piglets lose temperature. So not only is it important to have a good insulating material like plastic on the premises, and good supply of paper for delivery, but it is also essential for the piglets have a localised heat source, to provide them with the required thermal comfort (about 35°C at birth), but at the same time not affecting the cooler environment that sows need (18-20ºC) for their own well-being. The use of the Rotecna Ni-2 in farrowing provides piglets with the perfect environment all year round. 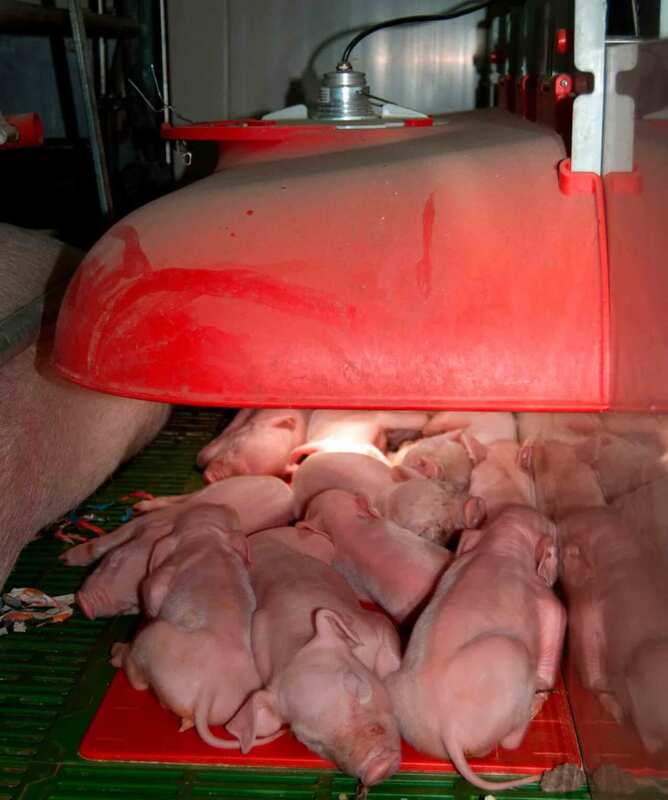 This ensures that the generated calories are concentrated in a limited space for the piglets, without the need to increase the ambient temperature in the barn. This method creates energy savings in heating of between 30% and 40%, depending on how farrowing pens are organised. To test these figures, we performed a test on a commercial breeding farm with about 1,950 productive sows, Binapig, in the province of Huesca. The test was run in two farrowing barns, with 20 pens each and two Rotecna electrical heating plates (600x400mm, 70W) per pen as the sole source of heat. In one of the barns (control), the normal temperatures on that farm were maintained, where the plate surface temperature (35°C, 33°C and 29ºC) and the ambient temperature (24ºC, 23°C and 22°C) were reduced week by week (Table 1). The Rotecna Ni-2 mobile was installed in the other barn, 40 cm above the heating plates, keeping the same ambient temperature as in the control while the surface temperature of the plate was decreased slightly (1ºC or 2ºC) with respect to the reference values from the control barn. We performed two replicas by reducing the temperature of the plate by one degree in the Ni-2 barn and three replicas reducing it by two degrees, but always checking that microclimate temperature was equal to or greater than that of the control barn and the piglets' behaviour suggested thermal comfort. In both barns, we recorded the ambient and microclimate temperature (approximately 15 cm from the ground, above the plate) and noted the daily electricity consumption per barn for heating. We also evaluated mortality and the mean weight gain of the piglets in each barn, although there were some piglet movements. In the first test, the use of the Rotecna Ni-2 mobile led to an energy saving of more than than 28% in lactation as a whole (0.95 kWh/farrowing pen and day in the control barn, compared to 0.68 kWh/farrowing pen and day in the Ni-2 barn). With this pattern of temperatures, approximately 55% of the consumption occurs during the first week, when the piglets' temperature requirements are the highest and the body heat provided by the animals is low; in the second week it is about 35% of the total consumption and in the last week it is only 10% of energy costs. Despite decreasing surface temperature by one degree, with the Ni-2, a 2.4°C warmer microclimate was achieved (28°C versus 25.6 ºC in the control), with no differences in ambient temperature. With regard to piglet performance, no differences were observed in weight gain, although lower mortality was observed among piglets in the barn with the Ni-2. Given that the results with a decrease by one degree were favourable in all aspects, we then assessed the same situation but with a reduction by two degrees. The results were also positive, with an average saving of 31% (0.86 kWh/farrowing pen and day in the control barn, compared to 0.59 kWh/farrowing pen and day in the room with the Ni-2). Despite the 2ºC decrease in plate surface temperature, the Ni-2 achieved a 1.7°C higher microclimate temperature and slightly better results in production: lower mortality, and greater weight gain. If we consider the average consumption for both tests, a saving in heating of about 30% is achieved. - Cost of electricity: €0.098/kWh the energy savings amounted to a total of €2,919 per year. Even so, the energy savings with the Ni-2 could be increased even more by turning off the plates during the last days of lactation in the hotter months, or trying to reduce the temperature by more degrees, since two degrees less on the surface will still achieve almost two degrees more in terms of microclimate with the Ni-2 as opposed to the control barn. But the benefits are not only in energy saving, but also in better piglet performance. Although there have not been many replica tests, the results show an improvement in piglet weight gain, but most especially a reduction in the mortality rate, from 7.6% (11.8% to 10.9% mortality) to 29.4% (from 13.6% to 9.6%). Every 1.5% less mortality in absolute terms, on a farm of these characteristics, with 1,950 sows, represents approximately 938 more piglets weaned/year. So, calculating an average production cost of €29/weaned piglet, in terms of productivity the use of Ni-2 represents a profit of more than €27,000 a year. In these conditions, the Ni-2 pays for itself in half a year, and from then on, the savings in energy and improved productivity become net profits. In conclusion, the use of the Rotecna Ni-2 in farrowing leads, on the one hand, to energy savings in heating of over 30% and, on the other, to an improvement in piglet production in the form of a reduction in mortality and a slight increase in weight at weaning. On a farm like the one where the test was conducted, with 1,950 productive sows, the minimum estimate of energy savings due to the use of the Ni-2 is approximately €2,900/year, to which we can add an estimated profit of more than €27,000/year due to the reduction in mortality, assuming a decrease of 1.5% in absolute terms. The overall savings mean the investment is amortized in approximately half a year. Even so, the energy savings still can be further optimized by turning off the plates in the last week of lactation in the summer, or even reducing the plate target temperature by a degree or two.